This machine, seen here in 2002, simulates the vibration, G-forces and pressure spacecrafts encounter during launch and landing. 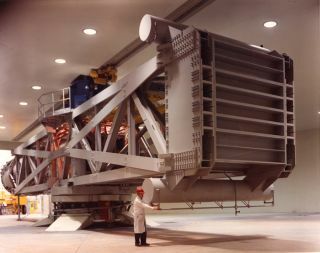 In this historical photo from the U.S. space agency, Goddard's Launch Phase Simulator or High-Capacity Centrifuge simulates vibration, G-forces and changing pressures that a spacecraft would encounter during launch and landing. To perform a test, which typically lasts one day, technicians place spacecraft components and even entire satellites in either the simulator's cylindrical test chamber (at the far left in this photo) or on its test platform at the other end (it was not installed when this photo was taken). Powered by two 1,250- horsepower motors, the facility then spins at up to 38.3 revolutions per minute to simulate a 30-g environment. (Most people experience about 2-g when they ride on a roller coaster.) Engineers monitor test results from an adjacent control room.